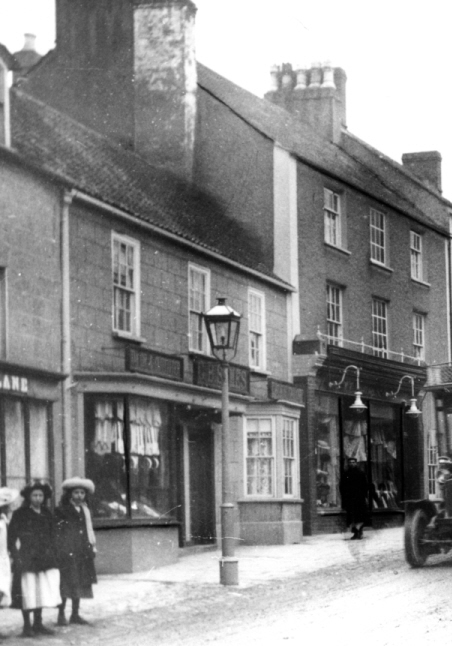 We haven’t seen any deeds of the building that is now 41 High Street in Thornbury. We are fortunate however that we have two abstracts of title of the premises next door (43 High Street) which describe many of the owners and occupants of this property. An Abstract dated 1875 tells us that 41 High Street was where Jonathan Barton formerly lived afterwards his son, John Barton then John Iles, John Hobby, Isaac Roberts and lastly Mrs Ann Anstey. We have been able to supplement this information with details from other sources. An indenture dated 5th April 1760 relating to 43 High Street mentions that Jonathan Barton was then residing in the property on the north (which is now 41 High Street). Jonathan Barton – Jonathan Barton was baptised on 16th October 1705. He was the son of John Barton, a butcher and his wife, Sarah (nee Winstone) who had owned the property at 5 Silver Street before 1720. Jonathan also became a butcher of Thornbury. In 1727 following his father’s death he inherited property in St Mary Street which he let out to tenants until he sold this in 1758. On 24th January 1731 Jonathan married Mehetabel or Mehitibel Hughes at Thornbury. They had at least three children: Ann, Thomas and John. Thomas born on 14th February 1742 but not baptised until 13th October 1762. We have not seen the baptism records of the others. ‘I give and devise unto my daughter Ann, all that messuage or tenement wherein Daniel Pitcher a saddler doth now inhabit situate in Thornbury aforesaid and which I purchased of my brother Thomas Barton, with the closet, workhouse, the northward half of the necessary house the Inward backside the back stable and free passage backwards from the said messuage to the said little house workhouse backside and stable and also to a lane or street there called Soapers Lane. To hold unto my said Daughter Ann and her heirs for ever. I give and devise to my son Thomas all that messuage or tenement wherein he now dwells situate in Thornbury aforesaid lying to the southwardside of the above mentioned messuage or tenement, with the outward backside, the shade (shed?) in the Inward backside, the stable and slaughter house adjoining together, the pigsty, garden, the other part of the said necessary house, and all the ways passages and appurtenances to the said last mentioned premises belonging and now in his possession (except what is given to my said daughter aforesaid). To hold to my son Thomas and his heirs for ever. I also give to my said daughter the use of my furnace where it now stands in the messuage or tenement above given to my son. I also give to my said daughter my silver tankard to be delivered her within a month after my decease. I give to my son, John, all my wearing apparel to be delivered to him within one month after my decease and as to all the rest and residue of my goods, chattels and personal estate of every nature and kind I give the use to Mehitable my wife during her natural life and after her decease I give the same …..to my said son and daughter Thomas and Anne equally to be divided between them as Tenants in common. And I do appoint Mehitable my wife to be sole Executrix…Twenty eighth day of January in the year of Our lord One Thousand Seven Hundred and Sixty Nine’. The will appears to show that Jonathan was leaving the two properties which later became 39 and 41 High Street. The land tax records of 1780 to 1784 show Jonathan’s widow, Mehitabel, owned the property valued at 9 shillings and occupied by two persons. By 1796 and 1797 (the next land tax records we have seen) the two properties were separated, one owned by John Eeles valued at 4 shillings, and the other owned by Thomas Barton valued at 5 shillings. We don’t know when Mehitabel died. The deeds of 37 High Street show that the adjoining property on the south side (i.e. 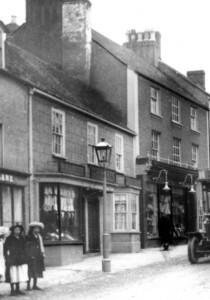 39 High Street) was owned or occupied by John Eeles which confirms our assumption that he acquired the property initially left to Jonathan’s daughter, Ann. We don’t know what happened to Ann. Thomas Barton acquired 41 High Street and the land tax records show him as owner until 1809. The two properties still share a common passageway providing access from the rear of their properties onto Soapers Lane. John Barton – we assume that John is the son of Jonathan Barton (see above). John Barton was a Butcher of Crossway. He married Sarah, daughter of William Bartlett of Moreton, Yeoman, and Elizabeth his wife on 16th May 1758 at Thornbury. John received only clothes from his father’s estate in 1769. He was buried on 4th October 1797. Sarah died on 30th January 1783, aged forty-five years. John and Sarah had several children including: Elizabeth born on 13th July 1764 and baptised on 12th August 1764, Ann born on 17th August 1767 and baptised at Thornbury on 20th April 1768, Metabel born on 23rd November 1770 and baptised at Thornbury on 9th January 1771, Jonathan born on 25th August 1773 and buried on 4th May 1774 at Thornbury, Sarah born on 18th July 1775 and baptised at Thornbury on 13th October 1775 and she may well have been buried on 18th October and Thomas born on 15th September 1776 and baptised at Thornbury on 4th December 1777 and he may have been buried on 7th November 1779, aged three years. Benjamin Pierce (or Pearcy) – a tenant of the property in 1782 and 1783. We suspect Benjamin was the perukemaker who had owned 7 Castle Street in 1769 and been living at 31 High Street as tenant of John Longman in 1780 and 1781. James Gastrell – a tenant of the property in 1780 and 1781. We suspect that James Gastelll died in 1787 aged 39. His wife, Lydia, was a governess for a school of young ladies in 1791 when she married John Croome a schoolmaster. Isaac Mullington – the 1796 to 1798 tax records show that Isaac was living there as a tenant of Thomas Barton. Isaac Morgan Mullington (sometimes spelt Millington) was born on 19th March 1764 and baptised on 3rd May 1764. His mother was Margaret Mullington of Kington. Isaac married Hannah Bailey on 1st February 1785 at Thornbury. They had at least one child, Mary, who was born on 10th March 1796 and baptised on 28th March 1798. The IGI has an entry for the baptism of a daughter, Hannah, on 4th September 1794. Another entry shows a son, William, was baptised on 4th September 1794. We note however William died aged three years and was buried on 9th April 1797. An indenture dated 1789 relating to the purchase of the Cossham Hall shows that Isaac was living at the property later known as 2 Chapel Street. Isaac took over the occupancy of 54 High Street in 1802 following Grace Mullington who had been listed as the occupant in 1800. Isaac was still living there in another legal documents dated 1805. We can’t be sure of the connection between Grace and Isaac. The Cheltenham Chronicle of 11th October 1810 has a report that indicates that Isaac and his family are going through some very hard times. He was found guilty of stealing coal and other articles but the judgement was “respited” because Isaac sought permission to join the army. The Ancestry website has an Isaac Millington serving in India with the 32nd Regiment from about 1804. Isaac would have to have been at home between postings with this regiment if he was the same person. Hannah died aged 80 and was buried on 9th May 1830 in the Poor House. If this is the wife of Isaac it means that she was 14 years older than her husband and quite old for that time when she had her last child. Richard Smart – the 1810 and 1812 land tax records appear to show that Richard had become the owner and occupant. He also appeared to own the property next door (number 39 High Street) which he let out to John Barnett. We don’t know anything about Richard. Enoch Higgins – the 1814 land tax record appears to show that Enoch Higgins was renting the property to Henry Bindon. We don’t know anything about Enoch. Daniel and Elizabeth Ford – by 1819 Daniel Ford was listed as the owner and John Hobby was the tenant. We note that on 4th June 1804 Daniel Ford married Elizabeth Hobby, a widow at Hill and suspect that John was Elizabeth’s son. Both Daniel and Elizabeth were living at Hill at the time of the marriage. Daniel died in Hill aged 60 and was buried on 18th April 1816. In 1821 to 1824 Elizabeth Ford was the owner and Isaac Roberts was the tenant. It looks likely that Elizabeth never lived in the High Street property as we note that like her husband she died in Hill aged 66 and was buried on 4th February 1832. John Hobby – several abstracts of title mention that John had occupied the property after John Iles and before Isaac Roberts. The land tax records show John living in the property as tenant of Daniel Ford in 1819. As mentioned above we suspect that John was the stepson of Daniel Ford who owned the property. On 1st October 1805 John Hobby married Susanna Grey. In the 1841 Census records show that John and Susanna were living at Crossways and John was an agricultural labourer. Susanna died aged 62 and was buried on 26th January 1842. The 1851 Census shows John was aged 68 and had been born in Hill. Ann Anstey – the 1851 Census shows Ann living in the property. She was a widowed grocer aged 28 living there with her sons, Henry aged 3 and Thomas aged 6 months. Also living there were an unmarried house servant , Jane Harris aged 26 and Ann’s brother, John Burchell, a carpenter aged 22. The 1907 Rate Book shows 41 High Street was void. Frank Edmonds – Frank was a watchmaker and jeweller. We know from an indenture relating to 43 High Street that Frank was occupying 41 High Street at some time before 1st March 1923. Frank’s name also appears in Thornbury’s Trade Directories from 1923. Frank was the son of Charles Edmonds, a clerk in an assurance office, and his wife Martha. He was born on 30th September 1873 in Somerset. The 1881 census shows that he was the grandson of John Edmonds a tailor and draper from Olveston. Frank was brought up in the Walcot area of Bath. In the 1891 census he was already a watchmaker’s apprentice aged 16. We have learned from a website for the Edmonds family that in April 1895 there was a newspaper story that Frank rescued a boy from the canal in Bath near the swing bridge. He married Sarah Ann Goodwin in the June quarter of 1898 in Bath. The 1901 census shows that he was living in Portsmouth and was aged 27. His wife Sarah was aged 28 and she was also from Bath. They had a son Charles aged only four months at the time of the census. We understand that the couple had four children in all. The first child was Winifred who was born on 27th May 1899 and who died in December the same year. Charles who had been born on 20th December 1900, died aged only 13 in Surrey. Harold was born on 19th June 1903 in Portsmouth. Their last child was Violet who was born in 1906 in Blindley Heath in Surrey. We have learned from his family’s website that Frank gave up his shop in Portsmouth to follow a musical career. He first went to Blindley Heath in Surrey to be a choirmaster and organist before moving to 45 Folkstone Road in Dover to become an organist at Christchurch, Dover. Several other jobs followed including being an Estate Agent and School Attendance Officer. He then enlisted in the army in World War I and was sent to Newark. After moving to Thornbury and opening the shop at 41 High Street, Frank stayed here the rest of his life. The special register compiled in 1939 in preparation for the war describes Frank as a ‘watchmaker, jeweler, optician and engineer’. 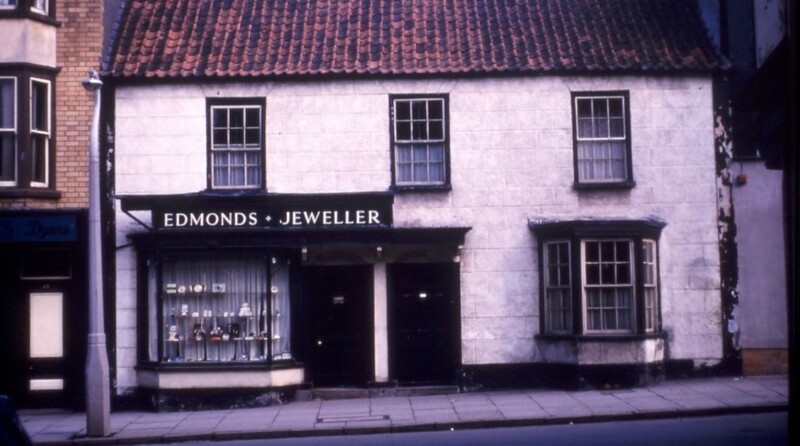 On 5th February 1949 the Gazette newspaper had an article describing the funeral of Frank Edmonds, jeweller and optician of the High Street in Thornbury who had been a tradesman in the town for many years. He was taken ill shortly after his marriage to Miss Edith Holloway whom he had married in Thornbury early in 1949. He died in Southmead Hospital in Bristol a few days later on 28th January. His funeral took place in St Mary’s Church. Click on the thumbnail images to see larger photos of Frank’s shop. The second photo below has a man whom we assume to be Frank standing in the doorway. We know that Edith carried on with Frank’s shop. In November 1955 the Gazette reported that she had taken prompt action which prevented a serious fire at her premises. A short circuit in the fuse box set fire to the rubber coating of a cable. Edith immediately turned off the electricity and poured water over the fire. She is listed there in the electoral registers we have seen up to 1961. By 1965 she was living at The Lion House, 9 Castle Street with her sister, Kate, and her husband, William Henry Nicholls. 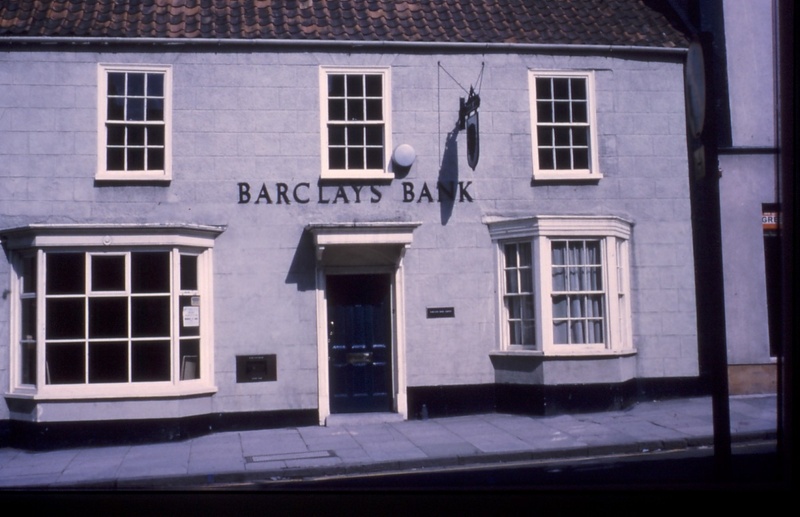 Barclays Bank – the property has been used as by Barclays Bank for many years now. We assume that they moved there in the late 1960’s, but would love to hear from anyone who know more.